If a conservatory belongs to property, the tenant should consider the quality of this extension. Otherwise there is the danger that might at a later mold colonization the landlord cause an incorrect user behavior in the field. Depending on whether it is a hot or cold conservatory, the type of use in the lease is to be regulated. To residential use of the winter garden in the cold season too, you have the build quality to be at least as high as for the other rooms of the building. It is important to secure rain failsafe glazing and a high standard of insulation. The floor area is to insulate as well. All other components are run free of thermal bridges. The winter garden needs its own heating. 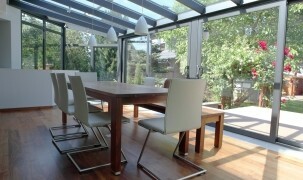 In addition to the quality in other living spaces requires the conservatory a shading system and a ventilation system. Heat-retaining and moisture control components to complement the large glass surfaces increase the quality of construction. Serves the conservatory not for residential purposes and waives the homeowner on a heating system, then be careful. A low standard of insulation of the glazing and inhomogeneous components lead to thermal bridges in the winter months. Throughout the day it heats the air and therefore can hold more moisture. By the drop in temperature at night it comes to the formation of condensation on the coldest parts. Is there enough organic material found, mold growth may beginn. Due to the risk of mold, the room can not be used practically in the winter. It is for the tenant even an increased time spent by frequent airing of the glass extension. Even the living room during the cold season it is practically impossible to be aired across the winter garden, otherwise the heated air flows into the cold glass extension and the relative humidity increases. In sum, the tenant has with the “maintenance” of the conservatory more work and no benefits. If the conservatory has the above-mentioned deficiencies, the owner should communicate openly and in this regulate in the contract. The tenant needs to know how can be used the conservatory and what care is needed for this effort. If a use is not practical in the cold season, then there should be no rent for this area agreed. This entry was posted in mold and tagged mold colonization, organic materia, regulated in the lease, winter garden on 2012/10/03 by joachim-w.